Turns out I am not very good at this hiatus thing. 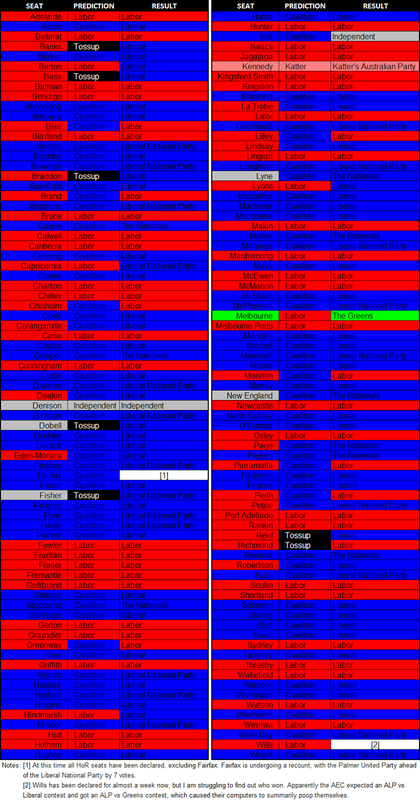 I was just going to update the data in earlier posts as the AEC confirmed the election results, but several requests have led me to address a few other matters, so I may as well post them afresh here. This ammounts to 127 predictions correct out of 141 known results, or just over 90%. 90% is the bare minimum I would consider a decent result, since pure guesswork will get almost 50% and just a cursory consideration of polls and margins should make over 80%. 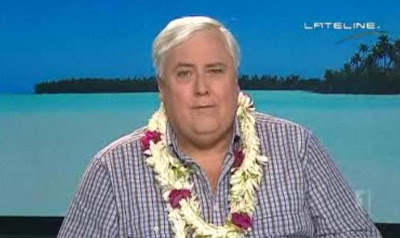 If we assume Palmer wins Faifax (which, with a lead of around 1% of 1% of the votes, is not at all certain despite what many media outlets are reporting) and Labor has won Wills (which I feel is by far the most likely outcome) this gives a success rate of 89.5%, which is not great. [EDIT: I can confirm Labor has won Wills. You just have to trawl through all of the seat-by-seat CSV downloads on the AEC website.] In the future it may perhaps be more meaningful to compare my success rate against a baseline of what would be predicted by applying a uniform swing from the polling data to the pendulum, thus accounting for abberant and bizzare electoral phenomena. One request I have recieved is that I provide a pie-chart of how many seats I have correctly predicted (you know who you are). This is also an excellent excuse to use this website, which offers pretty infographics but lacks the variety and neuances I normally require here. Sadly, until I have the Victorian and Western Australian data, it is too early to provide a meaningful chart. So instead, here is a meaningless one. Finally, I have been asked a couple of times to comment on the leadership election of the Australian Labor Party. I have not looked very hard, but to the best of my knowledge there is no public polling on the topic. And if there were, only ALP members can vote, so such pollig is either complex, or flawed, or complex and flawed. Instead, I am just going on gut feeling. The general perception is that Shorten is a statesman, bringing much needed (relative) dignity and calm to parliamentary debate after the percieved chaos of the last 3 (or 6 (or 38 (or 112))) years. Albanese, on the other hand, is seen as the attack dog of the Labor Party, taking the fight to Tony Abbott. Shorten is a member of the larger right faction and Albanese belongs to the weaker left. Shorten is implicated in the "revolving door leadership" problems of the ALP. Alanese was anointed deputy by "Rudd 2.0". Both have the skills and experience to lead the party forward. Both have some baggage from the past as well. My gut feeling is that Shorten will have the support in the party room, and Albanese will have the support of the "rank-and-file". The difference is that the Caucus will be firmly set in their ideologies, and the general members will be more easily swayed. Since the right dominate the caucus and the national executive, Shorten has to have the advantage here. However, my gut feeling is that Albanese will win based on the generally left-leaning views of ALP supporters (though this may not translate directly into members) and the desire to hound what promises to be a very brutal revision of ALP policies by the current government. There has also been speculation that whoever wins may offer the other the position of deputy. This obviously demonstrates unity in contrast to the Rudd-Gillard period, and follows the tradition of ballance. 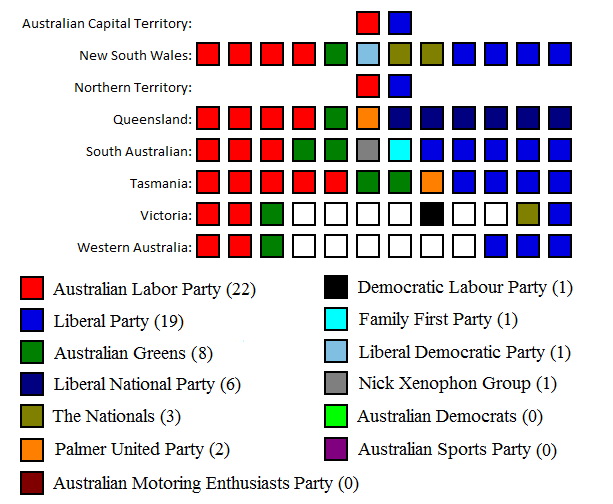 As Wikipedia points out "The usual arrangement is that the federal leader of the party is from the Right, while the deputy leader is from the Left, although former federal Labor leader and Prime Minister Julia Gillard was from the Left with support of the Right. Most of the Labor state Premiers are associated with the Right; there are some exceptions, such as former Queensland Premier Anna Bligh and South Australian Premier Jay Weatherill." I, however, doubt that this will occur. I think both have longer memories than the media and public who cling to this idea, and recall that Rudd's deputy was Gillard, that Hawke's deputy was Keating, etc. etc. etc. I would expect the loser to be given a decent shadow ministry to demonstrate stability, but at arms length from the leadership since a challenge -- or even challenge speculation -- is the last thing Labor neads. I therefore unofficially predict Albanese for opposition leader, a non-threatening and uncontroversial member of the right for deputy leader, and Shorten for Shadow Treasurer, Shadow Minister for Finance or some combined portfolio including workplace relations. Should Shorten get the leadership, Albanese would be well placed for simmilar positions, replacing workplace relations with something relating to civil liberties and equality.